Spoiler alert! You came here looking for Island Cycling maps, but we just want you to be sure you know what you're getting into. 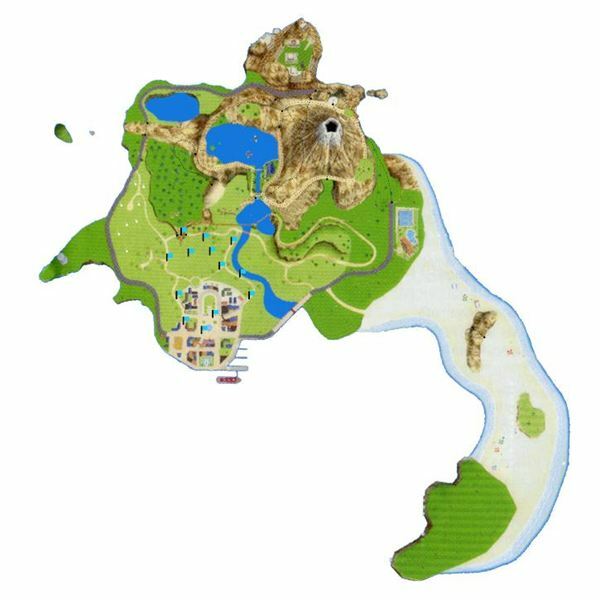 This article contains images of maps of Wuhu Island with flag locations marked. We also link to images with numbered flags describing ideal Island Cycling routes. The release of Nintendo's Wii Fit Plus gave us a new category of exercises to check out called Training Plus. Island Cycling is one of them. Island Cycling works by walking on the balance board or simply alternating lifting your heels in order to mimic the motions of pedaling a bicycle. While some people feel like this simulates biking pretty well, I personally find it unnatural-feeling and puts too much emphasis on the calf muscles. But I still enjoy it way more than I should in spite of that. It's almost exhilarating, given that Island Cycling is one of the few games where you can explore the entirety of Wuhu Island. Island Cycling has several different levels and even a few variations on its basic touch-the-flag premise. However, from experience we know how frustrating it can be to ride around looking for that last flag, or to get lost! Next, we'll talk about some user-modified maps available, from the basic Wii Fit Plus island bicycle map with trails, to maps marking the locations of every flag or balloon, and even links to maps with numbered flags indicating the ideal route. The beginner Wii Fit Plus island bicycle map is concentrated mostly in Wuhu Island's town and nearby environs north of the town, on mainly flat or slightly hilly terrain. After playing Beginner once or twice and putting in a decent performance, Advanced will open up to you. Only three flags somewhat overlap in position between the Beginner and Advanced maps, and those are just a bit west of the river. The advanced Island Cycling map shifts the action to wider-ranging, hillier terrain, sending you partway up a mountain and over rope bridges with some dramatic views, as well as rolling down a circular mountain interior. The Advanced course takes you east to the black-paved path and into the cliffs to the north and northwest. You'll also see some opportunities here for some death-defying jumps. There's no penalty for falling, so go ahead and be a daredevil! The Island View Course, unlocked after a few plays on Advanced, is even more wide-ranging, taking you around the entire island save for the sandy beach peninsula to the southeast. You'll get back into town and around the very outskirts of the Wuhu Island's coastline. Expert is the most difficult of this group of Island Cycling courses. The goal in Beginner, Advanced, Island View and Expert is to find all of the flags in the shortest distance. Not only will you be cycling to every corner of Wuhu Island that you've seen so far, you'll also venture into the beach area for three of the flags! The locations of the ballons in the Free Ride Island Cycling map are very similar to the locations of the flags in Expert, but with a different goal — cover the most ground you can (miles or kilometers) in 30 minutes, or pop all of the balloons in the shortest time possible. Twenty to thirty minutes is a respectable time, and we've seen excellent riders complete this course in 17 minutes or even less. 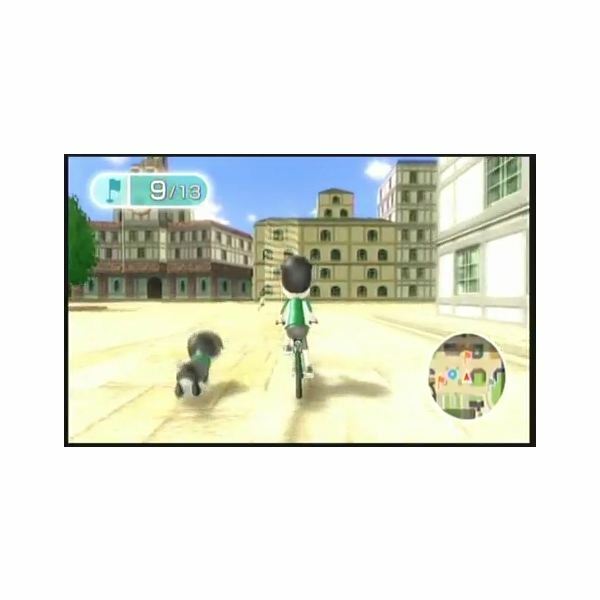 Use the basic Wii Fit Plus island bicycle map to learn the basic layout of Wuhu Island, and the level-specific maps as a reference for finding every single flag and balloon in Island Cycling. With practice you can complete them all in record time! Map images: Methusalem (Ka Prucha), https://members.aon.at/ka_prucha/. Used with permission.